"Minnie and Moo are two of the most entertaining and charmingly wacky bovine buddies ever to hit the printed page, and Barbara Caruso brings them refreshingly to life on audio. Caruso reads slowly and clearly, enunciating her words and allowing beginning readers time to follow the words, enjoy the illustrations, and appreciate the humor of Minnie and Moo's misunderstandings and adventures. In MINNIE AND MOO GO DANCING, Moo decides that people can go dancing "because they have thumbs," so Minnie gets them all dressed up, and they head out to dance the night away. In MINNIE AND MOO GO TO THE MOON, Moo decides that all they need to drive the farmer's tractor is his boots, hat, and angry words, and off they go. In MINNIE AND MOO SAVE THE EARTH, which sounds like an environmental tale, Minnie and Moo are busily exterminating "space invaders," and in MINNIE AND MOO GO TO PARIS, the pair manage to travel "around the world" in a progression of mistakes and misunderstandings sure to delight most 6-year-olds. The background music and sound effects combine to enhance the stories, and add just the right touch and mood. A winning combination!" "This read-along by Denys Cazet (DK, 1999) features two cows whose misperceptions of reality are used to create broad, slapstick humor for young readers. This time Minnie and Moo take off in a bus for what they think is a world tour, but is really just a jaunt around their neighborhood. They see Africa (a wildlife park), Paris (an electric power tower), and China, (a car wash). Narrator Barbara Caruso attempts to use different voices for the animal and human characters, but is sometimes inconsistent in her intonations and accents. Sound effects of the bus engine, animals in the African park, and other background noises are used. Young readers who are not familiar with the Eiffel Tower in Paris or the Nile may not understand the forced humor of the story plot. The book is a beginning reader, and the short, choppy sentences don't lend themselves to a smooth oral presentation." "This read-along of Denys Cazet's book (1999) finds gullible best friends Minnie and Moo taking an around-the-world bus tour, where they see sites they think are in Paris, Africa, and China. 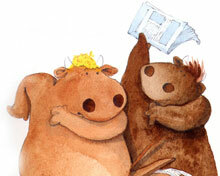 Barbara Caruso brings these eccentric and confused bovine buddies to life with her humorous narration. The trip provides ample opportunity for hilarious misunderstandings that will have listeners chuckling out loud. Young fans of the irrepressible Minnie and Moo will relish this delightful tale of two would-be world travelers."